I am using ModelBuilder to perform inverse distance weighting. I would like to interpolate values using a point file with values for several unique dates - resulting in a raster dataset for each unique day. My data is in long format where each row has a value for each coordinate/date. I have tried to create a model that performs the IDW on each unique day, using row iterator to iterate through each "date". It runs, but I don't think it's correct. Here is the model. This results in a raster dataset for each unique day. The problem is, each raster is identical. They should not be - the interpolated values should vary each day. Maybe I am using the wrong iterator. Can you please suggest ways to get this to work? It is a little confusing without seeing the data but I will assume your point layer o3_12days_v3 has a date field. In your iterator your group by field would be the date field so you can imagine that I_o3_12days_v3_date_id is a subset of points for a specific date being pulled out of o3_12days_v3. It is that green blob that needs to be the input into the IDW tool. This make sense as then the input is always changing with each iteration, at the moment you have only a static input but an iterator driving a loop that never feeds into the IDW tool. Top tip is if you are going to ask these types of questions you need to provide an image and a sample of data along with your question as that is critical in helping people understand your question. Not the answer you're looking for? Browse other questions tagged arcgis-desktop modelbuilder iterator inverse-distance-weighted or ask your own question. Sequence of Iterate Field Values in ModelBuilder? Nested iterator in model not working? 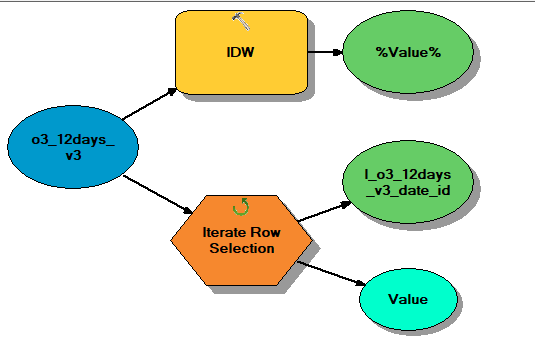 Using ArcGIS ModelBuilder row iterator?